Nytrex have installed a 40 bay loading bay Total Package of: Nytrex GT above dock Sliders, Nytrex Trailer Plates and yellow painted vehicle wheel guides for a major UK logistics company in Sheffield, England. Nytrex above dock Sliders prevent docking trucks riding over the dock bumpers, Nytrex Trailer Plates save money on replacement yard concrete where rocking trailer legs create unsafe wear holes and wheel guides ensure trucks dock onto the dock levellers squarely. This installation is part of a UK wide Nytrex success story supplying the UK's leading logistics and distribution companies. Many leading logistics companies now incorporate a further Nytrex innovation, The Nytrex L shaped above dock Slider. Given that a number of trucks these days ride over level dock bumpers causing major building damage, install the above dock Slider and prevent this costly problem. The Nytrex GT Slider is becoming the standard dock bumper configuration for above dock bumper systems. The L shaped cut out allows dock operatives access to loading/unloading docked vehicles without hinderance from the dock bumpers. With the "4 times the wear" capability of the Nytrex GT Slider, installation of this Nytrex system saves costly building repairs and constant rubber dock bumper replacement. 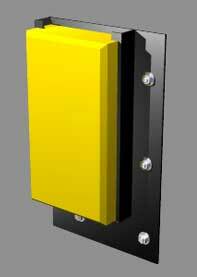 Switch to Nytrex® Safety Yellow dock bumpers and gain long term savings by preventing building and dock damage AND ongoing maintenance costs. 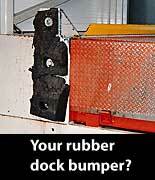 Replace your worn and torn rubber dock bumpers with Nytrex® dock bumpers now! unlike rubber, Nytrex® is easily recyclable. standard and non standard sizes and configurations. (Nytrex® only, not the fixings). IDEAL for air suspension trailers.